Beer captured our hearts and imaginations over 23 years ago and we have been regular visitors ever since. This picturesque fishing village is snuggled in the rolling hills in East Devon's beautiful coastal scenery. The beach is a natural sheltered suntrap and has interesting rockpools to explore. The cliffs rise 130 metres above the sea and form part of the South Devon coastal footpath, much of which runs through National Trust land. This area of the coast has been designated a World Heritage Site due to the important fossils found here. 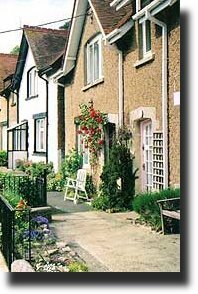 Beachcomber Cottage is a period stone cottage built circa 1900 in a quiet location with great views over the village. It's just 4 minutes from the beach and a minute from the main street with local shops specialising in cream teas and fresh produce, gift shops, galleries, pubs and restaurants. Improvments in spring 2005 include a downstairs cloakroom and new kitchen. A welcoming sitting room with plenty of comfortable seating around the fireplace with gas fire. There is a widescreen TV and video. Games, books and videos are provided to make you feel at home. The kitchen is extremely well equipped with plenty of crockery, glassware and utensils for your stay and is being refitted for spring 2005. There is a washer/dryer, hob and oven, microwave, dishwasher, ironing facilities and a fringe with icebox. There is a downstairs cloakroom with WC and handbasin. The bathroom has a bath with shower above, lighted mirror with shaver point, WC and handbasin. There are 3 bedrooms, two are double and one is twin. All rooms are tastefully furnished. The cottage is fully centrally heated. There is a sunny secure garden with barbecue and patio furniture.